Baseball is full of what I call pitching destructors, instead of instructors. They do more to break the pitcher down than to build him up. The problem is they see the pitcher as something other than an athlete. It takes an elite athlete to throw the ball 90+mph on a consistent basis. Yes, genetics has a lot to do with it and someone who is long, lanky and quick will have an easier time throwing 90+mph than a person who is short, stocky and slow, but genetics can be enhanced and this is the job of an instructor. Where most pitching mechanics go wrong is when the delivery changes from a ballistic movement to a choreographed movement. Pitching is not like dancing. It is more like a broad jumping. If a pitching instructor doesn’t keep this in mind then everything can go wrong. 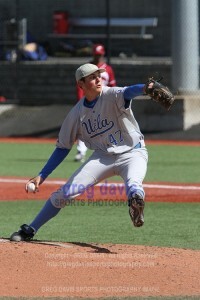 It is very common for hard throwing high school pitchers to go to college and loss velocity instead of gain velocity. This should only happen if an injury has occurred. This should never happen unless you have a destructor for a pitching coach.